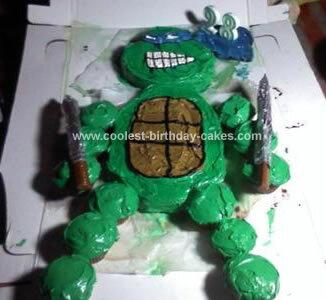 I found this Leonardo Birthday Cake on Coolest Birthday cakes.com and figured I’d show what my version on it was for my boyfriend’s 28th birthday (he is such a big kid). The cake was a hit, the only real problems I had was finding storage for something this big, and I didn’t ice the cupcakes until it was time for the party. Made transport much easier. I also found that the shell color on the body was probably the hardest color to come up with but a big mixture of every color from the assorted box of food coloring did just fine, but use lots of yellow. Also I crumbled up some of the left over cake into the shell icing to give it texture but was actually quite simple. I don’t want to take credit for someone else’s recipe but just wanted to share possibilities and my version.